Taylor Ellis is a Family Nurse Practitioner, Board Certified by the American Academy of Nurse Practitioners and a member of Sigma Theta Tau National Honor Society. She earned her Bachelor and her Masters of Science in Nursing at the University of Texas Health Science Center, San Antonio, Texas. 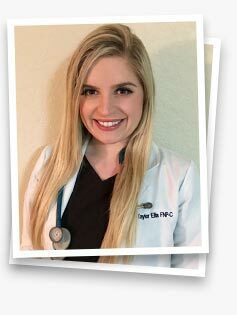 Prior to joining San Antonio Family Physicians, Taylor worked as a registered nurse for Methodist Hospital in the acute and intensive care settings. Taylor has over 5 years of experience in cardiac critical care managing pre and post-operative patients. In her free time, Taylor enjoys spending time outdoors and traveling, however, spending time with her family is her greatest joy. Through her experience in the critical care setting, Taylor has clinically responded to the effects of under-managed chronic diseases. In the outpatient care setting, she focuses on disease prevention and strives to emphasize the benefits that healthy choices and an active lifestyle have in optimizing health. Taylor believes that by treating each person as an individual, she is best able to help her patients maintain their health. She feels that the patient-provider relationship should reflect that of mutual respect and collaboration. Through this relationship, patients should be empowered to take an active role in their healthcare plans and decisions.